Kids and pets. Both noisy, messy, smelly, demanding, moody, clingy, expensive. Yet they both exude a limitless, unconditional love (usually with equal amounts of drooling.) I speak the truth because I've had both. I don't have any critters other than my two children right now, so I very much enjoy visiting those who have "children" of the furred-and-feathered kind. Which is why I was tickled by the latest rosé tasting at Eva's house. For you see, Eva has a menagerie. I discovered that as I walked up to her house and was aurally assaulted by raucous barking. That was Rocky, a boxer mix whose intimidating demeanour belies a big-sook personality. Then there was the husky, Timber, followed by a teeny-tiny Yorkie named Hudson. All three of them frisked me for treats and eyed me warily until they came to the conclusion I wasn't a threat. And that I didn't have treats. Dog ones, anyway. A flock of budgies in two cages--most of which were still infants growing into their flight feathers--kept up a noisy conversation, while the mutant-sized hamster did laps in his wheel and ground his teeth on the cage. But it's Rocky who runs the joint. If you have the audacity to stroll down the sidewalk in front of his house (yes, it's HIS, thank you very much) prepare to be met with a barrel-chested, feral-eyed beast with a growl that sounds more bear than canine. He kept up that deep, guttural rumbling most of the night ... in between licking my toes and insisting I throw his squeaky toy. Every time someone walked in the door, a great, wild cacophony ensued. Eva admonished them all like ill-behaved children and apologized for their manners. Then, in the middle of all that squawking, barking, squeaking and gnawing, we all sat down for a civilized (ahem) tasting of rosé. Francis Ford Coppola 2012 Sofia (Monterey County, California) - Bright salmon colour with a tinge of orange; rosewater, cranberry and roasted beet on the nose. Medium acidity with white pepper and herbs on the palate. Karlo Estates 2012 Frontenac Gris Rosé (Prince Edward County) - Still my fave. Almost fortified on the nose with elements of brandy and grand marnier. Stewed plums and raisins with a woody undercurrent round things out. 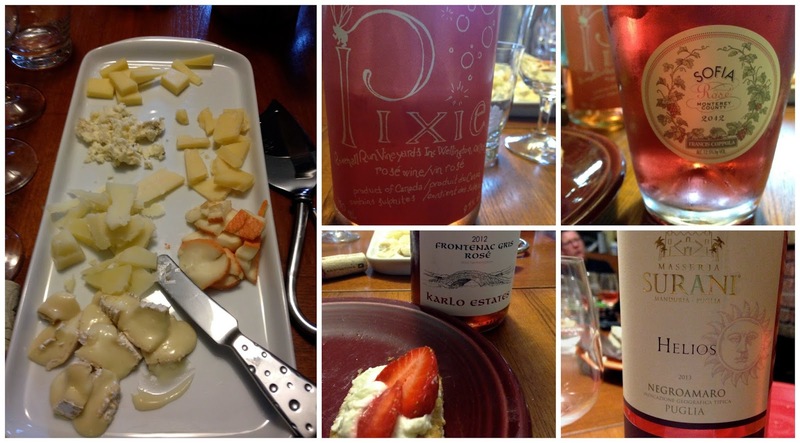 Flat Rock 2013 Pinot Noir Rosé (Niagara) - Slightly faulted (pyrazine - smelled like peanut shells. Comes from ladybugs that don't quite make it out before the grapes get crushed.) After airing out some, subtle notes of currants, mushroom and classic undergrowth came through. Tommasi Masseria Servani Helios 2013 Negroamaro (Puglia, Italy) - Cotton-candy pink, fizzy and flinty, with a muted scent of strawberries. High acidity makes the wine feel like it's evaporating off your tongue. Rosé is such a happy wine, an easy-going friend to all kinds of food. Eva put out a cheese board featuring apple-wood smoked cheddar; Avonlea cloth-bound cheddar; Dragon's Breath blue; Spanish manchego; and "The Drippy One", an oozing Brie de Meaux. Jane "Stewart" brought strawberry and cream cheese nibbles straight out of Food & Drink magazine and I brought along the last of the daily selection from the Cupcake Lounge. The dogs hovered around the table, sappy eyes gazing about, hoping for a handout or errant crumb. Or at least a couple of toes to lick. What they didn't get in food they were spoiled in love: all of us paused every so often to toss a toy, scratch behind the ears, speak in that cutesy voice reserved for babies and dogs (WHO'S A GOOOOOD BOY?) and rub bellies. At the end of the night, I swear Rocky looked up at me with a pout that clearly said, "Awk, leaving already?" We'll see each other again, big fella, and this time I'll bring the right kind of treats. I love Rocky!! Nice post Bethany.